After a long, but enjoyable, flight we arrived in Seoul, South Korea (the capital city)! We were warmly welcomed by Ae Ran Hwang and a small group of women who are all part of the conference planning committee. The committee has people from many disciplines from their pediatric hospice and palliative care teams, including nursing, counseling, music therapy and child life, many of whom are volunteers. They took us by car from the airport to Yonsei University, where we are staying. It is near Severance Hospital, where their program is. We were welcomed into our rooms with personalized welcome banners, fresh flowers and fruit baskets. Korea has historically been known for being “the Eastern country of courteous people” and we were just beginning to experience it. Every small detail was thought of and attended to. Courtesy and respect are the most highly cherished Korean qualities. This is demonstrated with one of the basic customs of removing one’s shoes before entering another’s home or formal place (formal restaurant, place of worship/historical place). Most homes and formal spaces have a small entryway to allow for you to remove your shoes before entering. In your own home/living area, you remove your shoes and put on special house slippers. Each of us had our own specially chosen pair awaiting us. You must slip out of your house slippers and into a plastic pair of slippers to enter into the bathroom area, while being careful to keep the plastic slippers only in the bathroom area and slipping out of those back into your house slippers again when leaving the bathroom area. You must always wear socks —no bare feet. After seeing our accommodations, we were taken to the first of many wonderful meals that we would share together. A traditional Korean meal has many side dishes, in addition to the main dish, so a place setting is made up of a bowl for rice or soup and several small plates to accommodate the many side dishes, along with metal chopsticks and a metal spoon. The side dishes, which are served on large plates on an area of the table for several people to share, are prepared in one or two bite portions that one picks up from the serving plate (usually with chopsticks) and transfers to one of the individual smaller plates at your setting. Frequently, one chooses things from several dishes to form the main dish. Tea or water is the beverage most often served with the meal. Short-grained rice, sometimes combined with other grains, soup and kimchi (pickled cabbage), are the Korean staples. There are also many vegetables served (both raw and cooked), frequently combined like a salad when raw. Korean cuisine is best known for beef, but chicken, pork and seafood are also common. It is all very healthy. I have not seen anything fried or much oil used. One can easily find Western chain restaurants in the metropolitan city of Seoul along with the cuisine from many other countries. Sunday after lunch, we went to Namsangol Hanok Village, which I likened to our Hale Farm and Village in Akron. 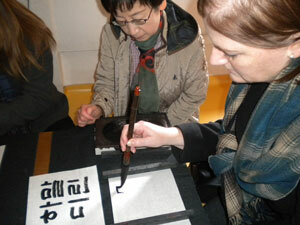 Hanok village is in the Pil-doing area of Seoul and it includes five Hanok homes that were moved there. Each home displays various types of furniture and goods to give you a glimpse of ancient Korea. Traditional activities are also offered so you can learn the history of – and participate in – the experience of ancient Korea. 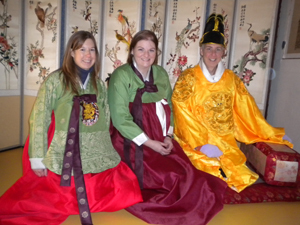 We had wonderful experiences – everything from dressing in traditional costumes called hanbok, learning the ancient art of calligraphy, having formal tea and witnessing a traditional wedding ceremony. After our afternoon there, we went off to enjoy a very nice vegetarian meal, made in Sarah’s honor. Meals are not rushed, so we have been able to talk a lot about how many Koreans feel about the experience of a child’s chronic illness and death and why they feel that having pediatric palliative care established here in Korea is so important. While we are here, we will be lecturing and discussing the importance of having pediatric palliative care and helping this team and hospital (as well as others) to build a strong pediatric palliative care team program in South Korea. Can spinal stenosis take a player off the field for good?